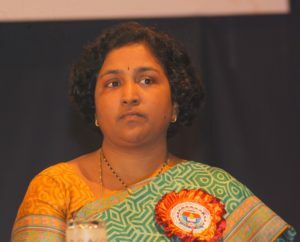 Prof. N. Usha teaches in the Department of English, Krishna University, Machilipatnam, Andhra Pradesh. Educated at Central University, Pondicherry, her major research interests are Comparative studies, Ecocriticism, Indian English Literature and the Literature of the Indian Diaspora. She has published extensively in these areas and also translated Telugu literature into English. She balances teaching, research and administration. She has presented research papers in various National/International Conferences in India and abroad, edited two books and published seven textbooks on English Language and literature. As a yoga enthusiast and master trainer in Human Values and Professional Ethics, she actively supports lifelong learning and environmental ethics. She has been recently appointed as one of the Coordinators of FSLE-India for its Andhra Pradesh Region. She has initiated to promote the LEGH Movement in the region.